Russia has developed a new cruise missile that is invincible, according to President Vladimir Putin. 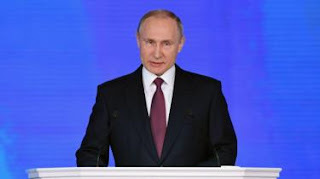 Mr Putin made the revelation as he laid out his key policies for a fourth presidential term, ahead of an election he is expected to win in 17 days' time. He showcased a range of new weapons, including the cruise missile that could "reach anywhere in the world". Using video presentations, he said the missile could not be stopped by the US shield in Europe and Asia. It was "a low-flying, difficult-to-spot cruise missile with a nuclear payload with a practically unlimited range and an unpredictable flight path, which can bypass lines of interception and is invincible in the face of all existing and future systems of both missile defence and air defence". Another weapon he discussed was a submarine launched, long-range missile capable of delivering a nuclear warhead.